A few weeks ago, Julep had a new Mystery Box up for grabs and of course, I just couldn't resist not picking one up. For this go around I decided to opt for the big Picnic Mystery Box ($39.99), which contained $120-$250 worth of products. In my Big Picnic Mystery Box I received seven gorgeous nail colors, along with three awesome lipstick minis! Vanessa: Multidimensional opalescent glitter in a clear base. This color is much more mesmerizing in person, than my pictures show it to be. The glitters will surely pop against a dark base color, which I can't wait to try out. Annette: Light, cool grey crème. This color could not have arrived at a better time. How lovely is this light grey going to be for the fall/winter months? Annette is prone to streaking though, but 2-3 coats help even things out a bit. Maya: Peachy pink frost. I am not really keen on nail colors with frost finishes. They just never seem to work out for me, and Maya is no exception. And the noticeable brush strokes that result don't make the situation any better. No matter how I apply this, the brush strokes are always visible. There is just no way of getting around it, unfortunately. Not all is lost though. I will reserve this one for nail art purposes. Evie: Berry pink with golden shimmer. This limited edition color was included in each mystery box. Evie has a wonderful and opaque formula that flows on the nails beautifully, and I think the golden shimmers compliment the berry pink base color nicely. Summer is almost coming to an end, and a bright and cheery color like this one is a good one to sport while we transition into fall. Catherine: Classic red crème. I probably don't need another red crème but honestly, I really don't mind having a few of them in my collection. Shades like this one are staples that are always nice to have at hand. Catherine was actually my mani color of choice last week, and I just loved everything about it. The formula is so creamy and easy to work with, and the color is amazingly opaque. You can totally get away with one thick coat, but out of habit, I always go with two. Gloria: Orange coral crème. I like how this coral contains an orange hinge to it. Super pretty! The first coat gives sheer and streaky results, but the addition of a thicker second coat smooths everything out and provides opaque coverage. Dianna: Mint green crème. I love mint green nail colors and Dianna sure is a gorgeous one. It can apply a little streaky on the first coat, but everything evens out with an additional one. It's no secret that I absolutely love lipsticks, so it was a nice surprise to receive a couple in this box. 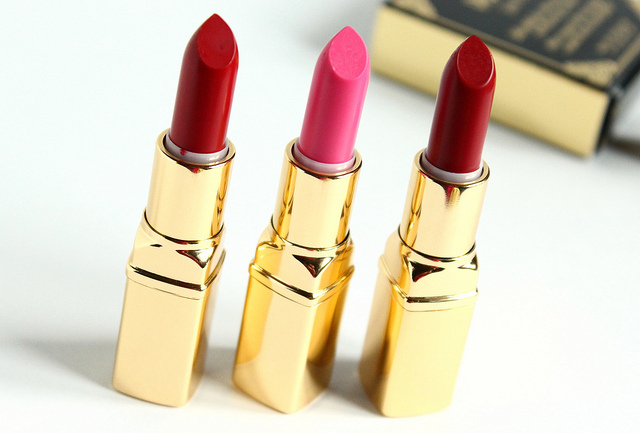 All three colors in the Paris Jazz Lipstick set are shades I would normally wear, and their miniature sizes make these awesome for traveling with. They all applied beautifully and had creamy smooth textures. 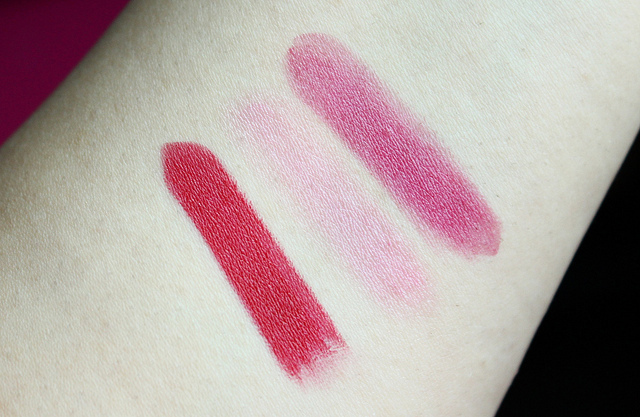 Lady in Red is a semi-matte and is the most pigmented of the bunch. Sweet Lorraine is much sheerer than I expected it to be, but it can be built up to a pretty pink tint on the lips. Charleston is a gorgeous berry red that I know I am going to be sporting loads come fall/winter. I love the finish of this, which mimics that of a tinted lip balm. Charleston is a nice pick for those of you who favor sheerer pops of colors that aren't on the loud side. Overall: The Julep Big Picnic Mystery Box was a winner for me. 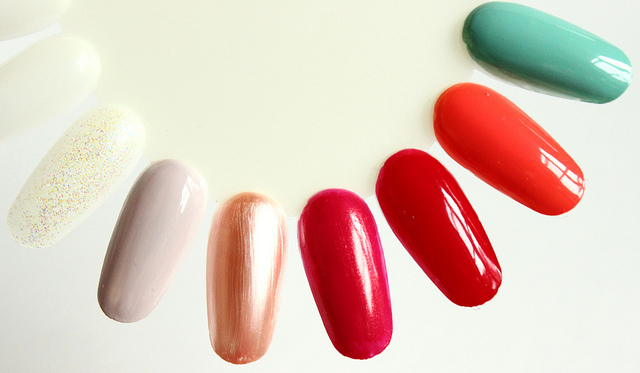 I loved the different variations of nail colors I received, and the lipsticks were an awesome addition. 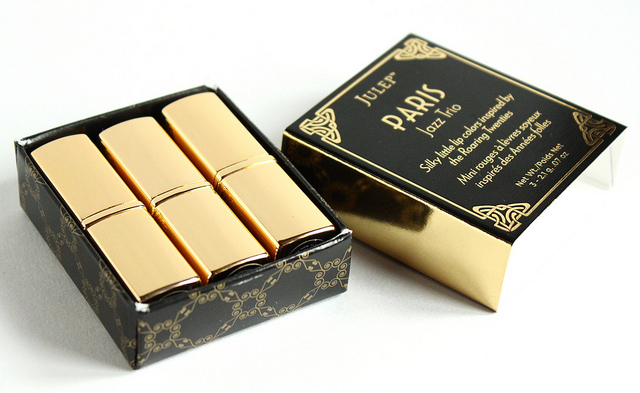 I can't want to see what Julep has in store for their next mystery box. 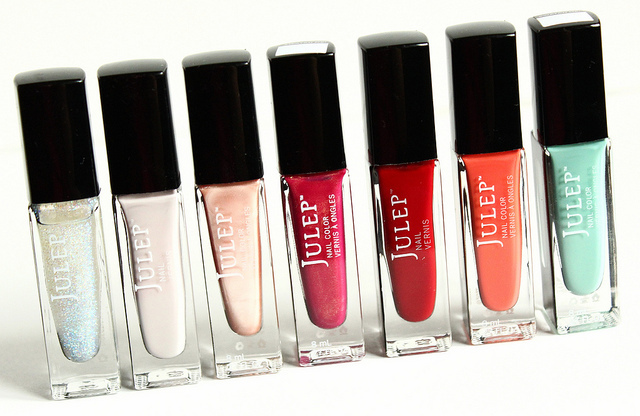 What do you all think of Julep's Mystery Boxes?